The Twilight Saga: Eclipse cast members Tinsel Korey, Alex Meraz, and Julia Jones (“The Wolf Pack”) joined UnitedHealthcare employees, community volunteers and students to help build a playground for LA elementary school kids at Resurrection School who haven’t had one in 60 years! 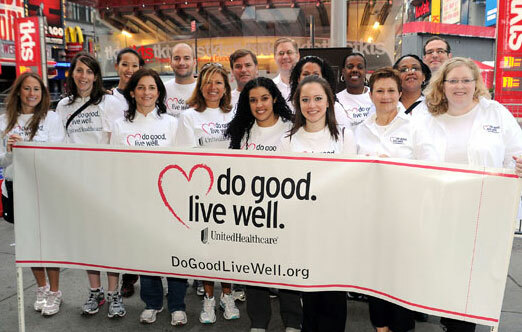 Their volunteer effort is part of the Entertainment Industry Foundation’s iParticipate and United Healtcare’s do good. live well. campaigns promoting volunteerism. 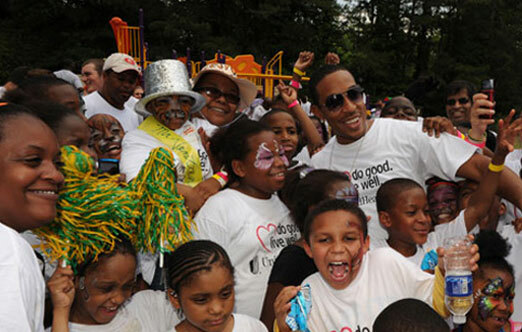 Multi-platinum selling, GRAMMY® award winning rapper and actor, Chris “Ludacris” Bridges joined more than 100 volunteers from UnitedHealthcare, a UnitedHealth Group company today, for a day of service at the Venetian Hills Elementary School as part of a larger effort within the Entertainment Industry Foundation’s iParticipate and United Healthcare’s Do Good. Live Well campaigns. More than 100 UnitedHealthcare employees are rallying around the company's mission of helping people live healthier lives by volunteering at the 13th Annual Entertainment Industry Foundation's (EIF) Revlon Run/WalkRevlon Run/Walk for Women in Manhattan. EIF's Revlon Run/Walk event is one of the nation's largest single-day fund-raisers to support women's cancer research, counseling and outreach programs in New York and Los Angeles. 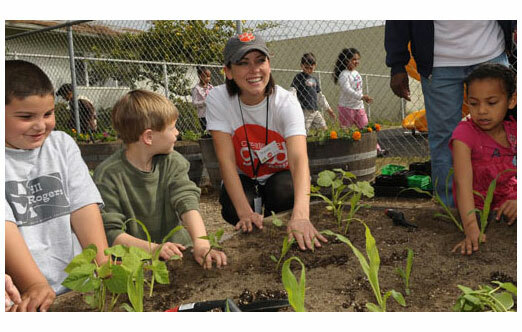 Professional volleyball player Gabrielle Reece, renowned athlete Laird Hamilton along with Teaching Garden founder and Hollywood philanthropist Kelly Chapman Meyer launched the nation’s second Teaching Garden at the Will Rogers Learning Community School. What's the Future of Volunteering? Marking the first anniversary of the Serve America Act, leaders of community service organizations including Shirley Sagawa, author of The American Way To Change, gathered at the Center for American Progress to discuss the future of volunteering in America. Click here here to see the Chronicle of Philanthropy video. One year ago today, President Obama signed the Edward M. Kennedy Serve America Act into law. This landmark bill signaled the largest expansion of national service since FDR. There are many reasons to volunteer, like giving back to the community or social networking. There is another important reason to volunteer, that you may not have considered: Volunteering is good for your health. Yes, studies show that volunteering provides benefits to both your mental and physical health. This means that the time you spend volunteering offers a double advantage: You help others and you're also helping yourself. See the full survey results (.pdf file). http://www.volunteeringandservice.org/ The annual event provides attendees with an opportunity to learn, connect and be inspired through exciting and informative plenary sessions, workshops, special events, service projects, exhibits, specialized corporate tracks and more. If you or your organization deals with volunteers in any capacity, this is an event you do not want to miss!